Never judge a book by its cover, the contents are much deeper on the inside. 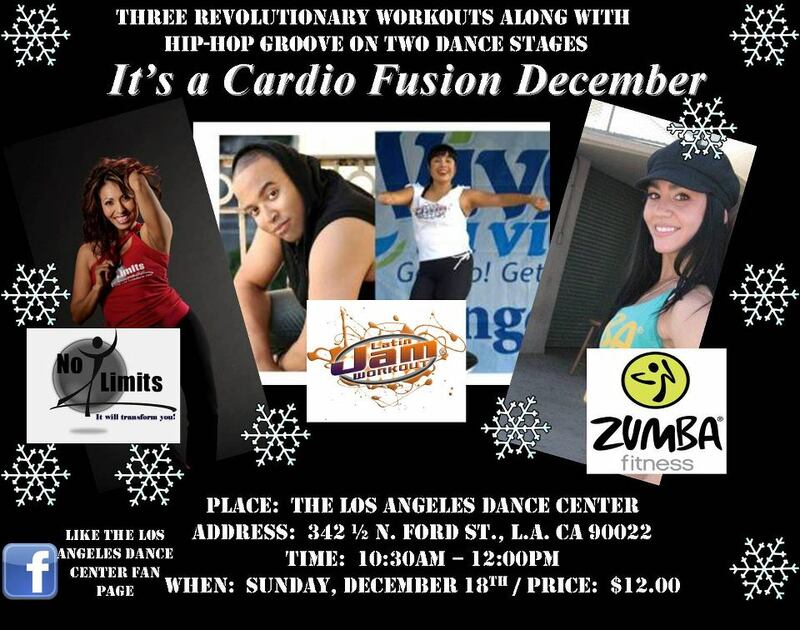 Four exciting workout genres collide together this Sunday, December 18th at 10:30AM at The Los Angeles Dance Center (342 1/2 N. Ford Street) to bring to you an intense workout session guaranteed to make you sweat and burn off those holiday calories. This 90-Minute Workout promises to bring you the very best in Zumba, CardioMax, Latin Jam, Hip Hop Groove and much, much more. Ruby Patino of NO LIMITS FITNESS will bring to you her brand of fitness that has been a staple for THE LOS ANGELES DANCE CENTER’S weekly schedule. Ruby’s very active in the community and has been an active supporter of CSOAF (Community School of Arts Foundation) which does their yearly ZUMBATHON and is prominent in promoting health and fitness such as the yearly Get Up! Get Moving event. Ruby Patino will also feature her NO LIMITS STUDENTS Yessenya and Jovita. Angela Correa, who is a four-time participant in the monthly fusion events will bring her exciting style of Zumba that has brought her a tremendous following of loyal supporters. 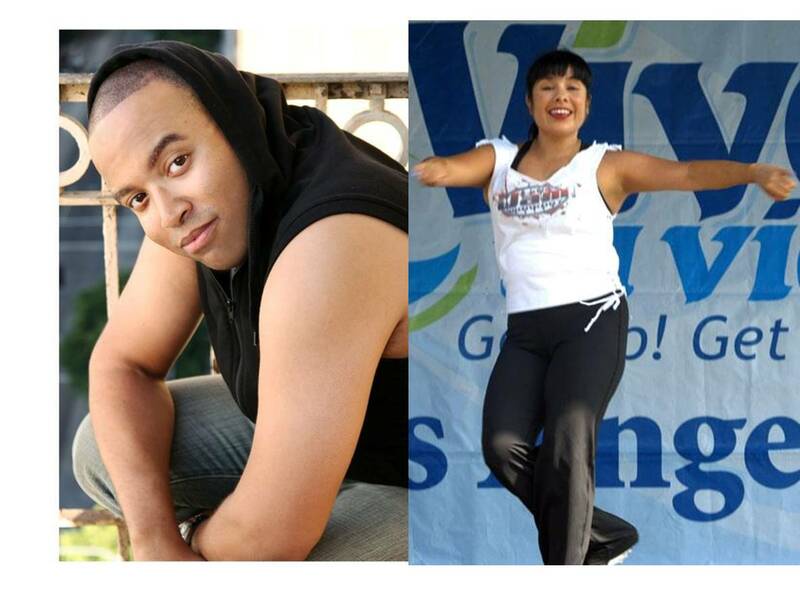 Angela teaches at 24 Hour Fitness in Mid-Wilshire and Groupx 24 Hour Fitness in Downtown and is very active in community events and awareness and most recently appeared alongside Ruby Patino in this year’s ZUMBATHON for CSOAF. Jerod Williams and Candice Vega (first time participants in this event) will bring an intense style of Latin Jam which combines the latest in Latin Music, Hip Hop and Reggaeton with Cardio. This high impact workout class is featured every Saturday morning at THE LOS ANGELES DANCE CENTER. Jerod (along with his co-partner Candice Vega) recently participated in the Get Up! Get Moving event and have been actively promoting JP Santana’s Latin Jam Workout brand for the past two years and evolved from being students to first-time instructors. There you have it, folks. Exciting Instructors, FOUR Amazing Workouts and TWO Dance Stages. The holidays are upon us and while you are making that Christmas List and checking it twice why not do your body right by giving it a proper workout all the while having fun and meeting some cool and fun people. TICKETS for the event are $12.00. Ruby Patino, Angela Correa, Candice Vega and Jerod Williams will be selling tickets as well. Feel free to hit them up for your pre-sale ticket.